Last week, our Fairy Tale Research Team, led by Dr. Jill Rudy, joined forces with the cast of BYU’s production of Into the Woods. Fairy tale fans and theater aficionados alike turned out to compete in fairy tale trivia, play “Match the Emojis to the Tale,” watch fairy tale inspired music videos, and munch cream puffs and bagel bites. Some lucky attendees walked away with free Into the Woods tickets after winning a raffle. With more than fifty in attendance, this was one of the FTTV project’s most successful events to date. After the treats and games, we migrated into a nearby auditorium for musical numbers and fairy tale presentations. Dramaturg Amelia Johnson, known on this blog for her guest posts, kicked off the second portion of the event with a quick intro to fairy tale theory before turning the time over to the rest of the cast for songs. Rapunzel safe in her tower with the witch and her hair. Madison Dennis and Ellora Lattin, playing The Witch and Rapunzel, began with “Our Little World,” a comical mother-daughter number, where a chair stood in for the elaborate tower of the set. The Witch has shielded her stolen daughter from the outside world for her entire life, and Rapunzel is okay with this arrangement — although she does wish her mother weren’t so unsightly. 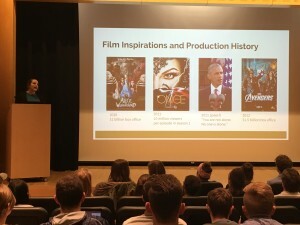 Cortlynd Olsen followed this with a presentation on the cultural context of Into the Woods’ stage debut as well as the inspiration and production history of the 2014 film. These ranged from the expected (Disney’s live action reboot spree) to the surprising (a 2011 speech where then-President Obama inadvertently quoted the musical). 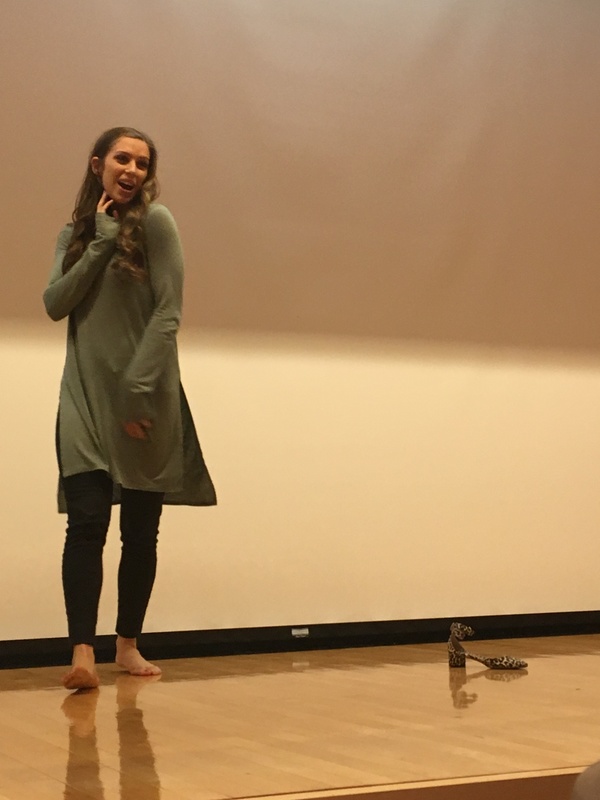 Next, Cinderella (Libby Lloyd) found her glass slippers (or rather, cheetah print heels) stuck in pitch on the steps of the palace. In this number she debates the pros and cons of marrying a prince she’s only known for a few days, and who thinks trapping his would-be wife in sticky pitch is a good way to start a relationship. 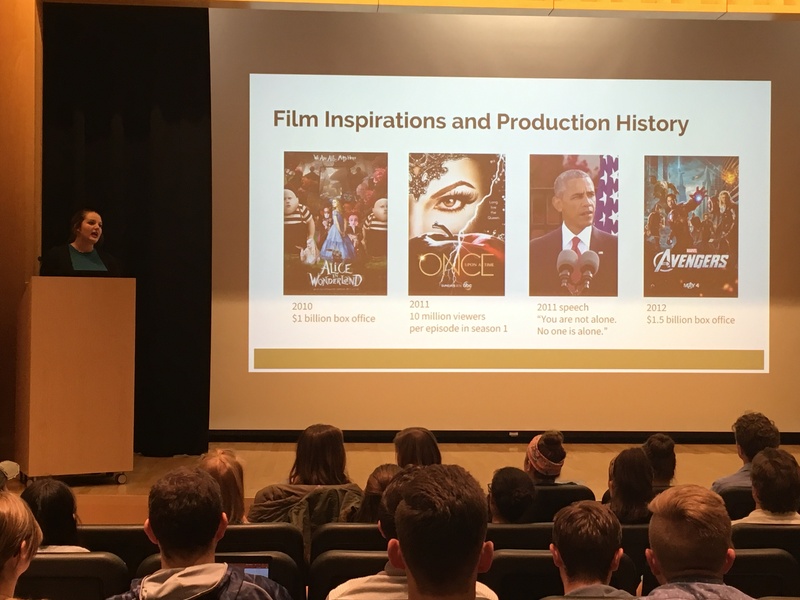 After Cinderella pried her heels up, Lauren Redding took the stage for a presentation on mash-ups, adaptation concepts, and deconstruction. 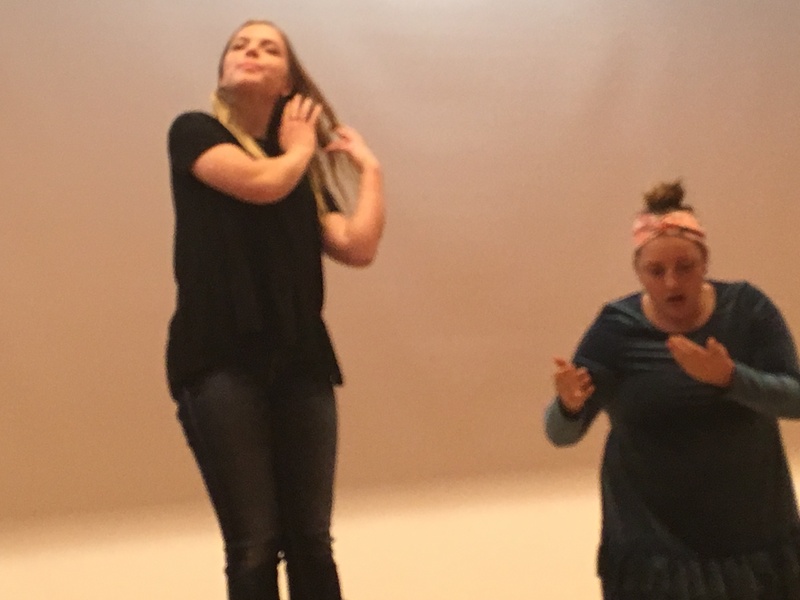 Deconstruction is particularly pertinent to the overall concept of Into the Woods, where wishes bring their own set of problems and consequences come into play after intermission. 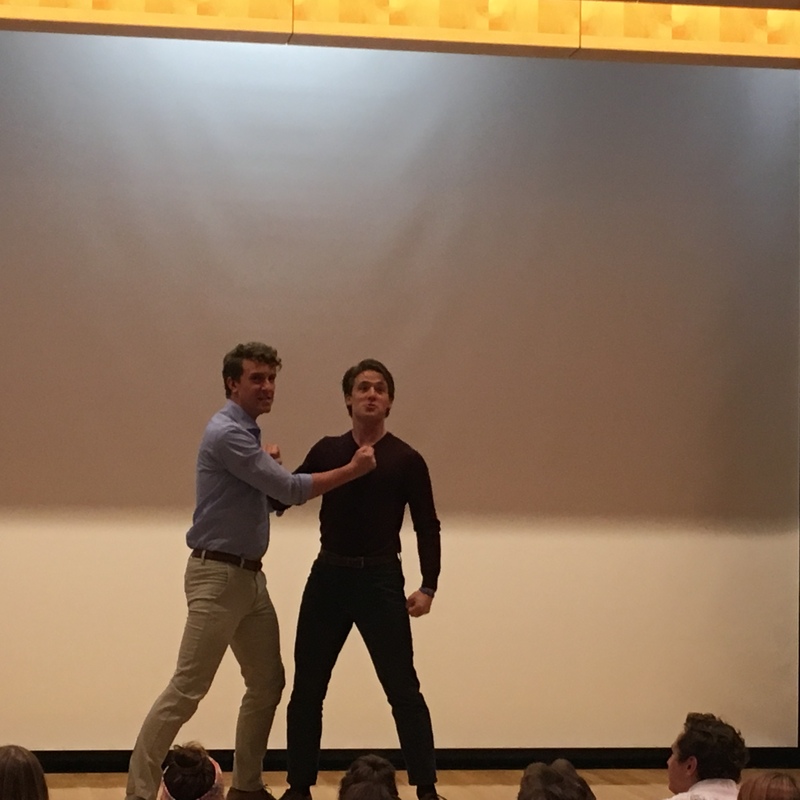 Last but not least, Rapunzel and Cinderella’s princes fought to out-whine each other in “Agony.” Life’s rough when your title, good looks, and charm aren’t enough keep the girl of your dreams from ditching you at midnight. But then, loving a maiden who can’t leave her tower is agonizing in its own way. Who has it worse? “Agony” is one of the most popular songs from the musical, a surefire crowd-pleaser, and our audience was no exception. 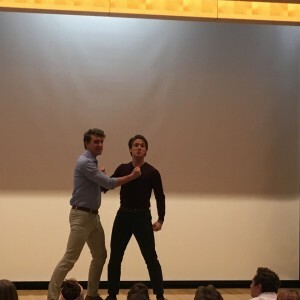 Everyone laughed aloud at the princes’ melodramatic antics, enjoying the informal setting that allowed them to perform without mics or costumes. After the brothers grudgingly admitted that there’s more than one way to be luckless in love, the entire cast was invited onstage for a panel discussion. Questions ranged from the complexities of fairy tale character archetypes in the context of well-known stage and screen precedent, to the struggles of depicting an an annoying, pompous Prince Charming. 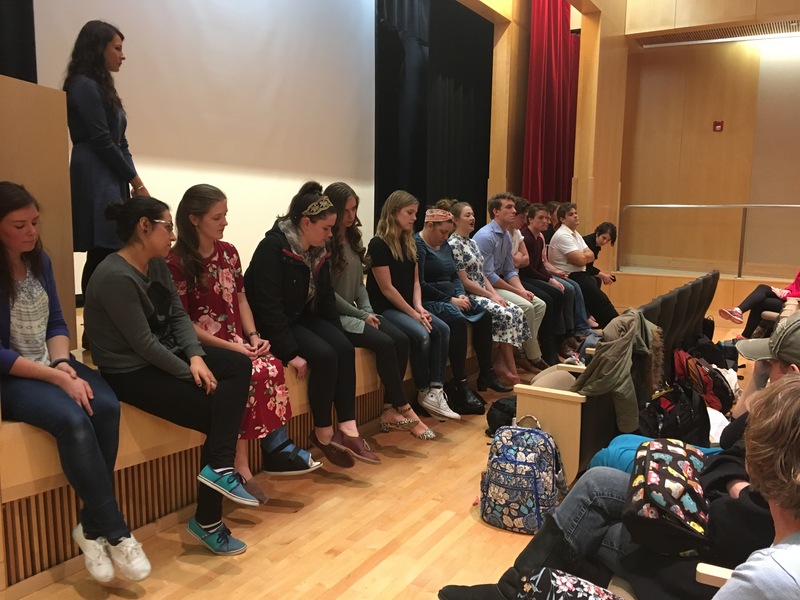 All in all, this event saw a great turnout, provoke thoughtful panel questions, and raised excitement for our theater friends’ upcoming production, which will open November 17 and run until December 9. We hope to do future Setting The Stage events that will be just as delightful! Special Thanks to the cast that attended the event and contributed to our panel! This entry was posted in Contests and Events and tagged Into The Woods, Setting the Stage Events, Theatre Department. Bookmark the permalink.